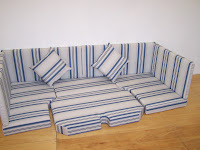 A set of upholstery for a Mirage 30'. 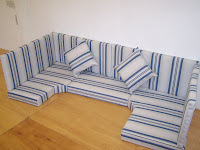 The fabric is actually acrylic canvas, which keeps the cost down, but is still very durable and comfortable. A wide range of striped and patterned acrylics are available. Thickness of foam can be adjusted according to your requirements, for example this set has 4" foam in the forepeak and saloon seating, and 2" foam backrests, with Velcro for attachment. 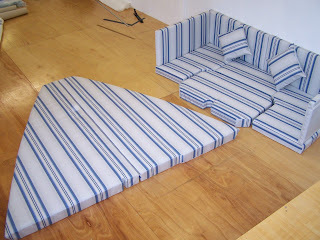 All cushions are zipped and wadded.